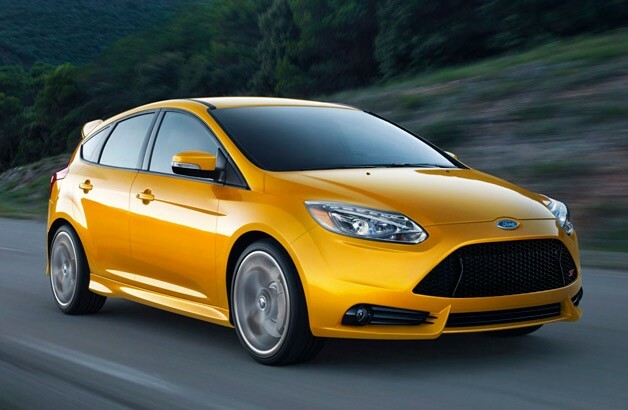 We may have to make do with the Focus ST here in North America (note: we are not complaining), but an even hotter version – the Focus RS – has historically been quite a hit in Europe. And according to a report inAuto Express, the next-generation RS should be one hot little number when it launches in 2014. Rather than simply turning the ST's 2.0-litre turbocharged inline-four up to 11, Ford's European performance division – Team RS – will likely use a larger-displacement mill for development of the hotter-than-hot Focus. The most likely candidate is a new 2.3-litre EcoBoost engine – rumoured to be shared with the 2015Mustang – that will produce around 350 horsepower. Ford will likely offer the Focus RS with a six-speed manual transmission, but engineers have not ruled out the possibility of using a version of the company's PowerShift dual-clutch 'box. The main concern from Team RS is that using a DCT will add weight, though the engineers understand that the trend in this segment is to use dual-clutch gearboxes. Auto Express reports that the new Focus RS will retain its front-wheel-drive architecture, but Ford is already working on new technologies to reduce the sort of squirreliness that comes with sending that much power to a car's front wheels. An active limited-slip differential – an E-diff – would "really optimise traction in all situations," according to Team RS powertrain engineering manager Len Urwin.